As animal lovers, veterinarians pride themselves on being trusting and caring people. They don’t want to believe anyone would intentionally hurt their pet, but in recent years, they’ve had to train themselves to look out for those who do just that as drug addicts turn toward animals to score pain medication they can’t easily access. Jones said the training starts in veterinarian school but has expanded to animal hospitals across the country as more and more report incidents with clients. “We’re always looking for signs of animal abuse,” Jones added. Twenty years ago, vets were told to closely examine pets, looking for recurring wounds and grilling their owners. Now, vets are told to take a close look at owners as well. Vets are extra cautious when they’re seeing new clients. Those typically tend to be the people who try to score drugs, Jones said. “The ones being abused aren’t seeing us regularly; they’re moving from vet to vet,” he said. If the pet owners refuse to allow the hospital to get a hold of previous records or come in actively looking for drugs by name — like Tramadol, for example — that triggers an alarm for vets. Vets are then advised to look for a drug-free, safe alternative to treat the injured animal. Veterinarians across the country have reported cases of owners using their pets to get their hands on Tramadol, an oral medication that has opiate-like effects. 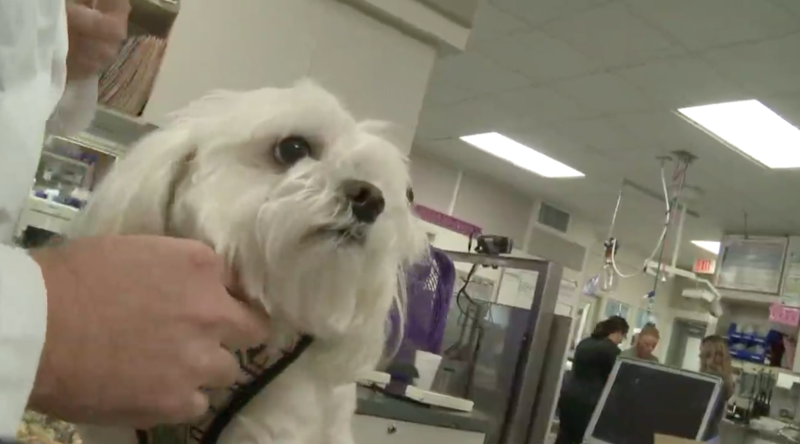 Dr. John Gicking, a veterinarian at Blue Pearl in Tampa, Florida, told CBS affiliate WTSP he also looks for red flags in owners whenever he prescribes the drug. “Prescriptions are being used up faster or they have been reported to being spilled multiple times,” Gicking said. In Kentucky, police say, a dog owner named Heather Pereira, 23, cut her dog with razor blades just so she could take the dog’s pain medication in 2014. She was sentenced to four years in prison, WSB-TV reports. Then in Oregon last year, a raid led to 100,000 Tramadol pills and a rescue of over a dozen dogs, WTSP reports. At Peachtree Hills Animal Hospital, Jones said they haven’t had an instance where they thought somebody was abusing the animal just to get to the drugs. But he believes there have been some who are taking their dog’s medication and refilling it early. “It’s just as bad because if a dog’s in pain, they really need them,” Jones said.